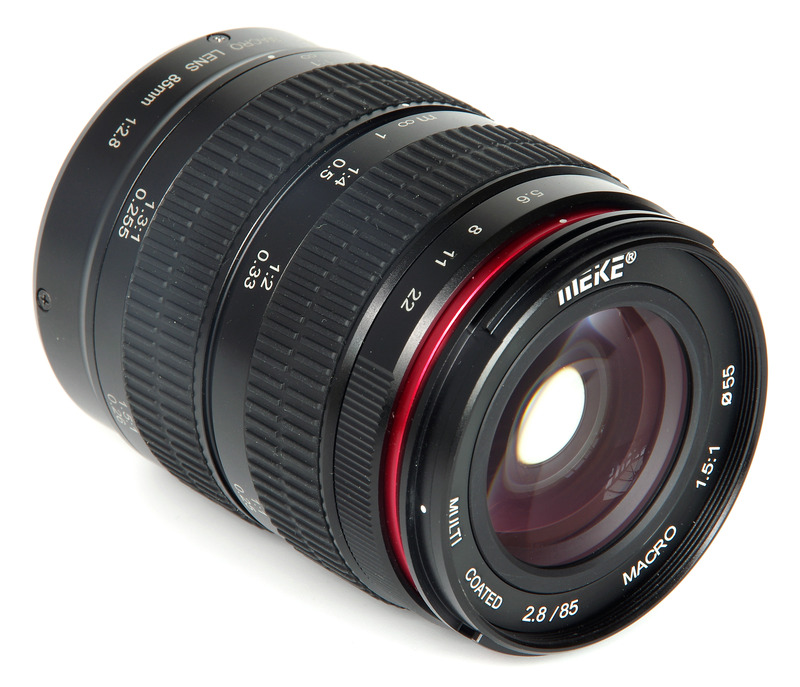 John Riley reviews the new Meike 85mm f/2.8 Macro manual focus lens for full-frame DSLR cameras. 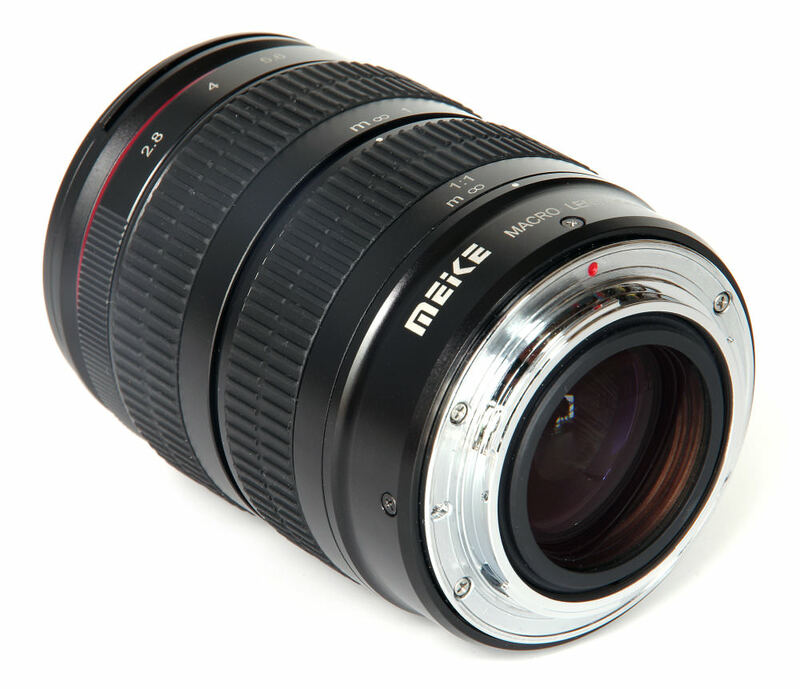 Meike is one of the relatively new breed of independent lens manufacturers, continuing to provide low-cost, innovative designs, and, sometimes, unusual specifications. This new 85mm f/2.8 macro lens is unusual in that it focuses down to 1.5x life size. Most macro lenses stop at life-size, some older designs even at half life-size. If performance is up to standard, then the extra magnification could be a winning feature, so let's have a closer look. This is a full frame lens, available in Nikon and Canon mounts. Balance on the Nikon D810 used for this review is slightly front heavy but in terms of size and handling the lens fits very well. It is manual focus only. 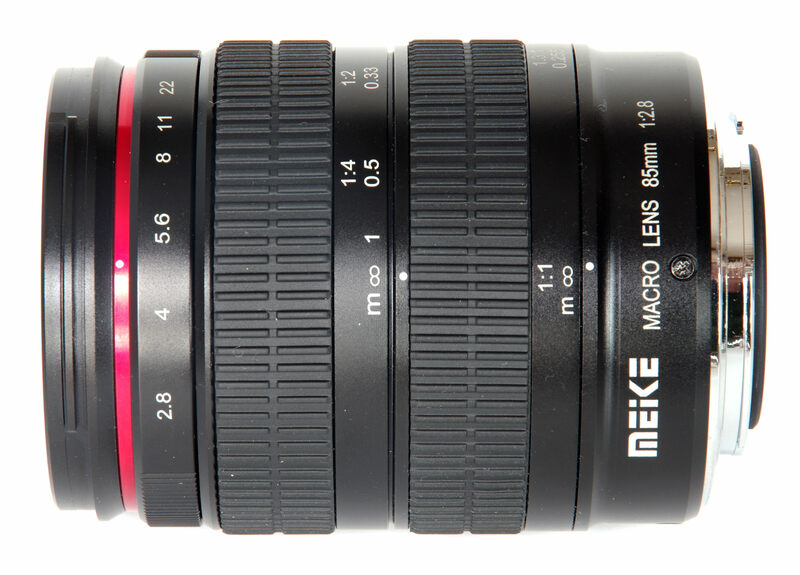 85mm is a fairly unusual focal length for a macro lens, most short telephoto macros are 90mm or 100mm, but it is the classic portrait lens, so there may well be potential there as well. It is substantially made using metal and weighs in at a solid 500g despite its fairly compact size. Starting at the front of the lens, we have a very well engineered bayonet fit lens hood with locking catch. This surrounds a 55mm filter thread. Looking through the front element, we see the 12 bladed diaphragm, manually set by the ring just behind. This produces a very effective round aperture, which bodes well for the quality of the bokeh. 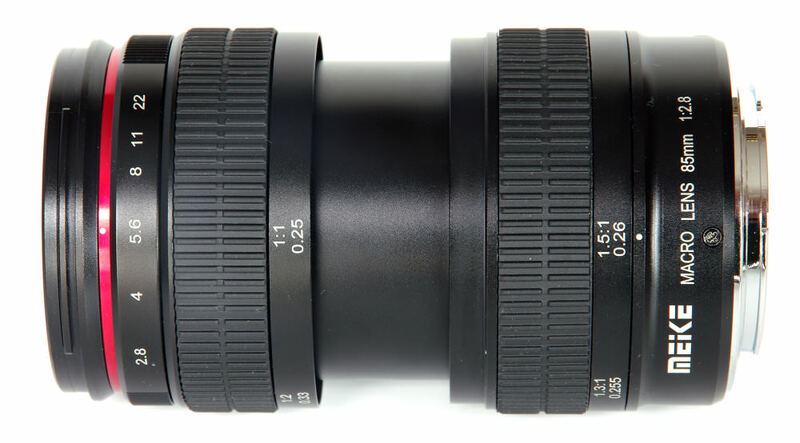 The lens is multi-coated, using nanotechnology. There are two focus rings. 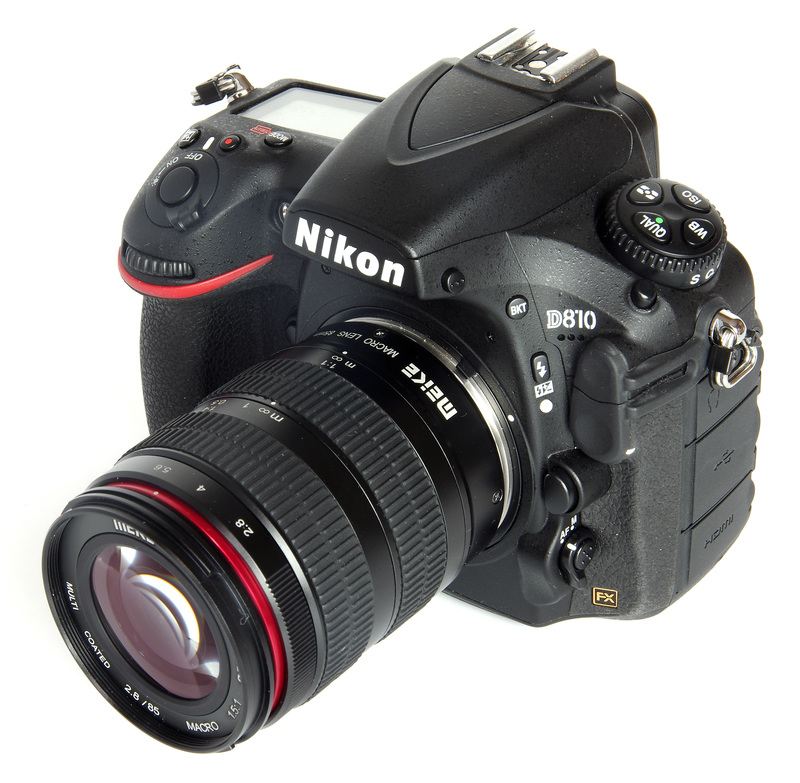 The first, closest to the front, use internal focusing and operates down to 0.25m, giving a magnification of 1:1. That is, an object 1cm long will be recorded 1cm long on the sensor. When set to the closest setting, the second ring can be used to continue down to a magnification of 1.5:1, meaning a 1cm long object will now be recorded as 1.5cm long on the sensor. This is a significant difference and a fairly unique feature. The first focusing ring concentrates its function very firmly on the closer distances. The amount of rotation between infinity and 1m is very, very small, meaning that hitting the exact point of focus for more distant subjects is quite tricky. As we move closer, the amount of rotation needed dramatically increases, so closer focus is very precise. Arguably this is a good thing for a macro lens. As well as distances, magnification ratios are also marked, which adds to the functionality as a macro lens. The second focusing ring has an equally long travel to focus, and at distances offering between 1.5:1 and 1:1 magnification this is very critical. This means a solid tripod and use of the self-timer to avoid any camera shake are vital, as well as a patient approach to finding the point of focus. Being a short telephoto, finding the focus is made easier, but it is still essential for it to be spot on for best results. This second ring does alter the length of the lens, so it may be necessary to move the lens backwards a little when working at the highest magnifications. Effectively this acts like a zoom at this point, as we approach 1.5x magnification so we need to back the lens off to 0.26m. For small items, focusing can sometimes be easier by moving the camera or the subject rather than by operating the ring. Traditionally, a tripod mounted focus rail would be employed to move the camera smoothly and precisely for just this purpose. Lens construction is 11 elements in 8 groups, suggesting that optical corrections have been made without recourse to aspheric elements or exotic glasses. This should still be capable of producing excellent results. Handling of the lens is trouble-free. It is well made, all the controls operate smoothly and the focusing snaps in and out with good clarity. 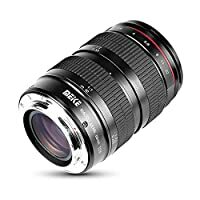 It is clearly designed from the outset as a macro lens, all the features enable that, rather than a standard short telephoto that focuses closer. Hence the emphasis on the accuracy of close focusing rather than the longer distances over 1m. Of course, its usefulness is extended in that it can also be used as a short telephoto for portraits and landscapes when required. When looking at the sharpness results we need to bear in mind that at test target distances the lens is not being used at the distances it is primarily designed for, that is macro shooting. The manual focusing ring is also not accurate at the test distances. This means that several runs of measurements were needed to ensure that the point of focus for the test chart were as precise as possible. In terms of sharpness, both centre and edge match each other almost perfectly. The figures are amongst the closest I have ever measured. So, both centre and edge, sharpness is at the upper end of the very good category from f/2.8 to f/5.6, moves into the excellent range at f/8 and is again very good from f/11 to f/16. Diffraction does reduce sharpness at f/22, but it is still of a good standard. Looking subjectively at macro distances, sharpness is still very even at f/2.8 and certainly, results are sharp, slightly reducing at the corners. However, at f/8 the sharpness becomes visibly crisper and more even from corner to corner. For even flat subjects, f/8 at macro distances will produce excellent results with well-controlled field curvature. CA (Chromatic Aberration) is also well controlled, centre and edge, and is unlikely to be a problem. At very high contrast edges there is some fringing, but for many subjects, this would be completely unnoticed. A short telephoto lens would be expected to show some pincushion distortion, but the demands of a macro lens are higher. These demands are well met by Meike and pincushion distortion measures at the extremely low value of +0.17%. This almost perfectly rectilinear and should not normally need any further correction. Flare is very low and shots against the sky do not reveal any artefacts or undue reduction in contrast. Bokeh was expected to be smooth, with the short telephoto tendency to throw backgrounds out of focus and a round aperture. The gradation and softness of the bokeh is very pleasing and should enhance any subject that we wish to isolate from the background. The availability so far may be limited to the US market, with a price tag of $299. Looking strictly at 85mm/90mm macro lenses, the choices are quite limited. There are endless options at 100mm. Of course, none of them offer the 1.5x magnification of the Meike. However, there is the Tamron 90mm f/2.8 SP Di Macro, probably the closest competitor at £399. There is no mirrorless version of the Meike yet, but when there is the Sony FE range would compete with their 90mm f/2.8 Macro G OSS at £889. Provided the UK price is in line with around £299, then it would offer excellent VFM, sacrificing AF but gaining significant extra magnification. 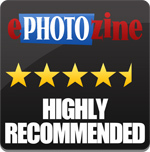 For more options have a look at the Top 13 Best Macro Lenses. An excellent macro lens with a unique 1.5x magnification.